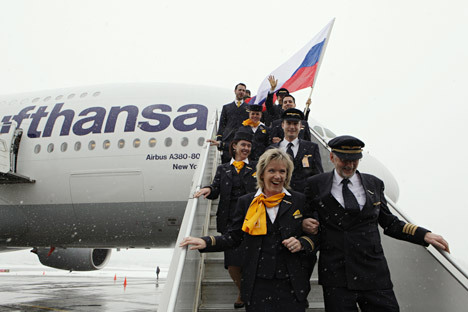 Starting from December 2012, EU aircraft crews will need visas to enter Russia or even Russian airports. The European Commission regrets Russia’s move, but Russia maintains that it is only seeking reciprocity and is no longer willing to go out of its way to please others. As of Dec. 1, civil aircraft crews arriving from the European Union are required to obtain visas to enter Russia. Even those who remain on board the plane at Russian airports are not exempt. The new requirement was not a bolt out of the blue, so to speak: The tighter visa regulations were announced a month ago, and a moratorium was in place in November to allow European airlines to process the paperwork for their pilots. "It is a matter of principle. We will no longer bend over backwards to please everyone. We want an equal dialogue," said Anvar Azimov, a special envoy of the Russian Foreign Ministry. In response, the European Commission expressed its regret over Russia's termination of the visa moratorium. "This runs counter to the spirit of the agreement to simplify visa arrangements, which is currently in progress, especially since a mutual agreement has already been reached to waive visas for civil air crews," said Michele Cherkone, the European Commission's press secretary for justice and home affairs. At last year's EU-Russia summit (Brussels, December 14-15, 2011) a list of common steps was drawn up to move toward a visa-free regime. It was assumed that the parties would come to a mutual agreement in 2014, but the process stalled. Difficulties have arisen because the EU does not want to allow free entry to Russian citizens on the basis of official biometric passports. Biometric passports in Russia are issued to diplomatic support staff, official representatives of international organizations who do not qualify for diplomatic passports, military personnel stationed overseas, and officials of state corporations. According to a source in the Russian Foreign Ministry, Russia was prepared to make substantial concessions: first, to restrict the number of persons with only biometric passports, and second, to exclude military personnel from the list. However, Brussels displayed intransigence, and Russia's diplomatic response was symmetrical. Still, the aftermath is likely to be felt by just a small number of European airlines. The Paris office of Air France said that its operations would not be affected. "The issue does not concern us. France has a bilateral agreement with Russia to facilitate entry for crew members of civil aircraft," said a company representative. Such bilateral agreements exist with 17 countries in the EU: 14 are intergovernmental, and three are individual arrangements between airlines (Aeroflot has agreements with Spain's Iberia, Air Malta, and Swissair). Yuri Materiy, a representative of the Russian Foreign Ministry, confirmed that pilots of countries with such bilateral agreements do not require visas. However, no such arrangements exist for Belgium, Greece, Hungary, Latvia, Luxembourg, Portugal, Slovakia, Finland, the Czech Republic, and Estonia. Air carriers from these countries will truly be scratching their heads in December. "We are ready to fulfill our commitments as per the list of joint steps adopted at the most recent Russia-EU summit, to work out an agreement on visa-free travel by the end of 2013. We hope that the EU will do likewise," said Azimov. He also restated that the next Russia-EU summit will take place in Brussels on Dec. 21. Visas are likely to appear on the agenda once again, which means that Russia's diplomatic activity in this area will not go unnoticed.